Growth stocks are typically purchased for their high rate of revenue and EPS growth. When everything goes according to plan, shareholders can earn excellent returns through a rising share price. Amazon (AMZN) is among the top growth stocks in the entire market. In the past five years, Amazon has produced annual returns of 39%, compared with 10.9% annual returns for the S&P 500 Index in the same period. But one group of investors might want to avoid Amazon stock, particularly if a recession occurs in the near future. Income investors, especially those with a high level of risk aversion, should favor income-producing dividend stocks. While Amazon is a top growth stock pick, it is not like that investors will receive an Amazon dividend any time soon. Even in the tech sector, many highly profitable companies pay strong dividends to shareholders. Tech giant Amazon has been public for over 20 years, but it has never paid a dividend. The reason for that is simple—Amazon has needed every spare dollar it could get its hands on. Expanding its retail operation has been an extremely cost-intensive effort over the years. Of course, this spending has paid off handsomely for investors, as Amazon now has a market capitalization of $867 billion. Amazon dominates the e-commerce market, which has fueled its impressive growth. Amazon generated $72.4 billion in fourth-quarter revenue, a 20% increase compared to the $60.5 billion generated the fourth quarter of 2017. Net Income increased to $3.0 billion ($6.04 per share) compared with $1.9 billion ($3.75) from the same quarter a year ago. For the year, net sales increased 31% to $232.9 billion from $177.9 billion in 2017. Net Income increased to $10.1 billion ($20.14 per share) compared to $3.0 billion ($6.15) last year. Amazon also provided guidance for the first quarter of 2019. The company expects net sales of between $56 billion and $60 billion, a 10% to 18% increase. For most of Amazon’s history, it did not pay a dividend because it simply could not afford to. Young companies typically burn cash for many years until they reach profitability. Amazon was no different, but now that it generates positive free cash flow, could in theory pay a dividend if it chose to. 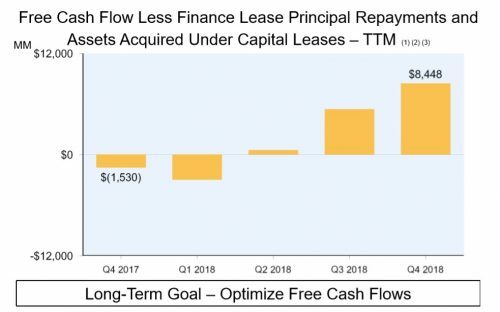 Last year, free cash flow less lease principal repayments nearly quadrupled to $11.6 billion, up from $3.3 billion in 2017. With over $11 billion in free cash flow last year, Amazon could pay a sizable dividend to shareholders. That said, investors should not get their hopes up for a dividend in the near future, as Amazon still prioritizes investment in growth over returning cash to shareholders. Amazon continues to spend on expanding its core retail operation, through internal investments and acquisitions like the $14 billion takeover of Whole Foods. In addition to grocery, Amazon is building its media platform and content library. Its future will also likely include a meaningful push into healthcare, as indicated by the $1 billion acquisition of online pharmacy PillPack last year. 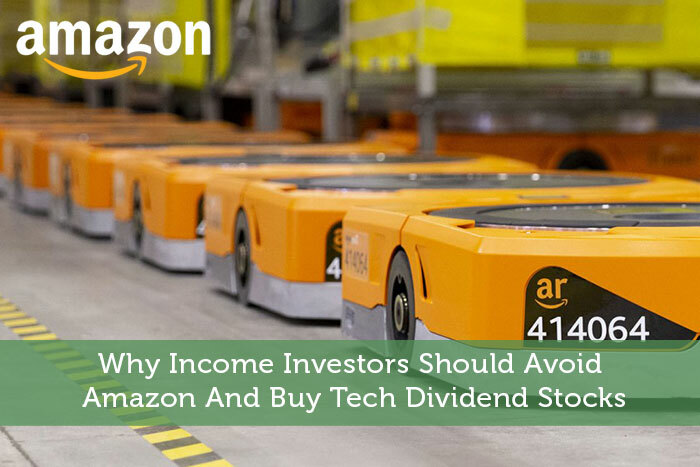 Therefore, even though Amazon has substantially increased its profitability in recent years, investors should not expect the company to pay a dividend. There are many areas in technology and elsewhere for Amazon to conquer, which is why income investors should pick a different tech stock. If income investors do not find Amazon to be a suitable stock, there are many other tech stocks with high dividend yields, without having to completely sacrifice growth potential. An example of a high-yield tech stock is Seagate Technology (STX), which currently yields 5.5%. Seagate Technology has a uniquely high dividend yield. Normally, dividend yields above 5% are confined to the utility sector, making Seagate a rare tech stock. Seagate Technologies reported its second quarter (fiscal 2019) earnings results on February 4. The company generated revenues of $2.71 billion during the quarter, a decline of 6.6% compared to the prior year’s quarter. Seagate Technologies’ gross margin was down slightly compared to the prior year’s quarter, but the company managed to cut its operating expenses meaningfully. Earnings-per-share totaled $1.41 during the second quarter, down slightly compared to $1.48 during the second quarter of fiscal 2018. Cloud storage is a major growth category for Amazon, and Seagate has made its own moves into cloud services. Seagate acquired a cloud-storage and software provider called Dot Hill Systems a few years ago for nearly $700 million. Separately, last year Seagate invested approximately $1.3 billion in the private equity-led acquisition of the Toshiba Memory Corporation. Seagate is investing to build its solid-state drives platform, particularly in growth areas like gaming and software-as-a-service. Seagate may not match Amazon from a growth perspective, but that does not mean it is completely without growth potential. Consumers are utilizing huge amounts of data, a trend that is not about to reverse any time soon. There are continued applications for growth including Internet of Things, data analytics, autonomous driving, and cloud computing. Seagate does not possess as much growth potential as Amazon, but that works to the advantage of income-seeking investors. Without the same capital reinvestment needs, Seagate can return a significant portion of its cash flow to investors. For example, Seagate generated free cash flow of $571 million over the first two quarters of its current fiscal year. It paid dividends totaling $361 million to shareholders in the same period, for a dividend payout ratio of 63% in terms of free cash flow. This allows the company to offer a generous dividend payout to shareholders, while leaving a comfortable level of cash flow for growth investment or debt repayment. Growth investors are likely to stick with Amazon, as well they should. But for other investor types, such as income investors looking for strong dividend payouts, Amazon may not be as attractive. Amazon has never paid a dividend. And while there is a possibility it could, it will likely not pay a dividend for many years. It continues to have the need for reinvestment in growth initiatives that far outweigh its desire to pay a dividend. On the other hand, high-yield stocks like Seagate pose a better alternative. Seagate has a strong business model and a high dividend yield above 5%.